Whether you are a new member seeking information on how the DLF works, or you are an active member interested in improving your involvement for bringing a smile to the less privileged, we welcome you to the Members' Guide to DLF. You are invited to help us improve The Members' Guide to DLF by sending your suggestions at Deepak@rotarydlf.org. We hope you will enjoy many rewarding experiences from your membership in DLF. What is Doll Lovers Fellowship ? 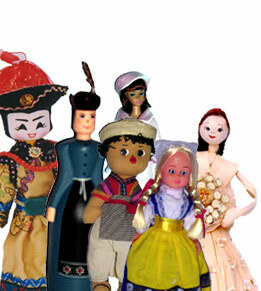 The Doll Lovers Fellowship is a network of like minded Rotarians and partners throughout the world agreeing to share their culture and traditions with each other in return for a favor of their virtual presence on the DLF website. The DLF is an organization dedicated to bonding the world together through an exchange of its culture, traditions and caring. 1) To truly make the Rotary Dolls Museum rich with a representation of each of the existing Rotary Districts around the world. 2) To make "Gift a Smile" movement more effective for the less privileged children across the world. What is the origin of DLF? The Doll Lovers Fellowship is an important missionary out come of the Rotary Dolls Museum ( RDM ) housed in the city of Rajkot, Gujarat State, India. The RDM is a project by the Rotary Club of Rajkot Midtown ( R.I. District 3060, India ). e-mails responded in a Museum-full of dolls and the RDM was inaugurated in July 2004.Today the Museum has a collection of over 1400 dolls from 525 Rotary Clubs from 293 RI Districts from 93 countries. It is an ideal example of true internationality of Rotary. Apart from the representing dolls, we have received letters or the articles sent with the dolls signifying culture, tradition, life-styles, recipes, prominent personalities etc. The sentiments and enthusiasm of the Clubs which have sent the dolls has been immensely portrayed from selection of typified cultural / traditional dolls & researching an article of the background of dolls to the packaging of dolls. Each doll is housed in glas cases along with the related information. So the children get the unique joy of learning about world culture & history. Some of them have hosted a "Send Off" party before the dispatch of the doll, while others have ensured that one of the Club members or its family member hand makes the doll. So much for the Museum made especially for the less privileged children to "Gift a Smile" on the faces of underprivileged children. Some Rotarians fell in true love with dolls and decided to make the logical extension in global way, thus this group of Doll Lovers registered the Doll Lovers Fellowship in February 2005. How does one enjoy the most of membership in the DLF? Explore: the members and partners in distant land for information of their culture, traditions, life-style. Communicate: Write, phone, fax, e-mail to others living in countries you wish to know more about. Exchange and seek ideas on your current Rotary projects. to join DLF. Tell them about www.rotarydlf.org - they can join DLF on-line. 1) The presence of your Club in the Rotary Dolls Museum. 2) "Gift a Smile" movement. Make suggestions: This is fellowship of your choice. Your suggestions and feedback may be just what can make a world of difference. Step up to leadership: Take the lead by offering yourself as a district or regional representative of DLF. How to get started in DLF? To become a member in DLF is easy. Be a member. Consult and share the information with your Club members. Join by filling up the membership form.  If you are joining the DLF to participate in the "Gift a Smile" movement, choose the toys that you want to send across. You need to send 50 toys for the less privileged children.  Remember these toys need to be more of play things than something to read and follow. Remember most of the less privileged children may not necessarily have the basic education. The toys may be of any sort but not hazardous to children in shape or material. They should look fresh and appealing to play with. And, the benefits of belonging to DLF are? Membership in a family of Rotarians and partners having genuine interest in the internationality of Rotary through opportunities for cultural sharing and rich fellowship. Ready made avenues for unique perspectives of distant places and their special characteristics while being in the comforts of your own room. The potential for developing life-long friendships and associations with individuals, couples, families and even groups of families from the exchanges of culture & traditions made. Frequent and open sharing of experiences with one another through newsletters and the website www.rotarydlf.org, contributing to a heightened level of enlightenment about other people, other countries and other cultures, or could we say: "international understanding and world peace". Share your Club's current projects with the Rotarians world wide. Opportunities to participate in the "Gift a Smile" movement for the less privileged children across the World. actually having seen it ! Join DLF for your unconditional love for the brethren of this Universe.